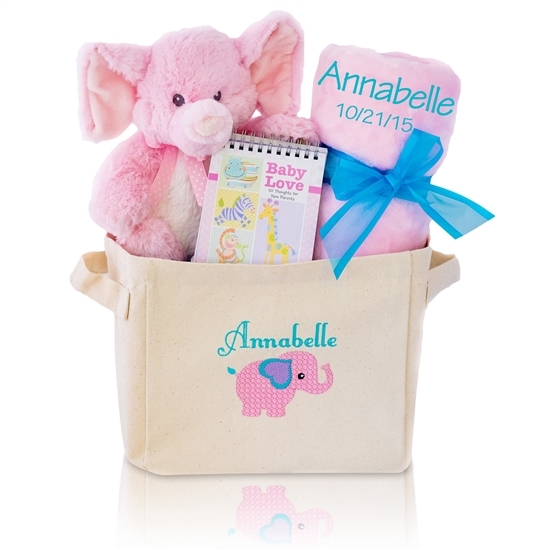 Our baby girl gifts under $100 offer you a broad selection of baskets, layettes, diaper cakes and more! You will get some terrific ideas to welcome the new baby home and see many charming creations to present at the shower. Each is designed and put together by our expert designers using only first rate materials of unsurpassed quality. In addition, many of these can be enhanced with the addition of customization using embroidery on blankets and outfits or imprinted artwork highlighting the baby�s name on items. Personalization elevates the "thoughtfulness factor" to your selection. Feel free to request our assistance with selecting your gift or to answer any questions you may have. Simply use our contact page or chat with us by phone at 866-476-0213. We stand behind every product and provide you with a satisfaction guarantee on your purchase. Likewise, every order qualifies for free shipping within the Continental U.S.!